À alguns dias atrás paercebi-mne que alguns produtos “antigos” apareceram nno Toys R Us. Como devem saber, a Longshot ainda é vendida em Portugal. Fui ao Website do Toys R Us ontem e vi que a Longshot estava classificada como produto NOVO. Podem ver no Print Screen que tirei. Procurei um pouco mais e o pack de 36 dardos streamline também apareceu no website Eu sabia que eles eram vendidos nas lojas – por eles apareceram na altura do Natal – mas não sabia que eram vendidos online). Para além disso, fui ao Toys R Us à cerca de duas semana atrás, e vi 10 Magstrikes ainda na caixa à venda, o que é estranho porque nunca foram vendidas aqui. Mas não tenho fotografia. Será que o Toys R us vai vender Nerfs “antigas” em vez das Nerfs novas? Esperemos que não! 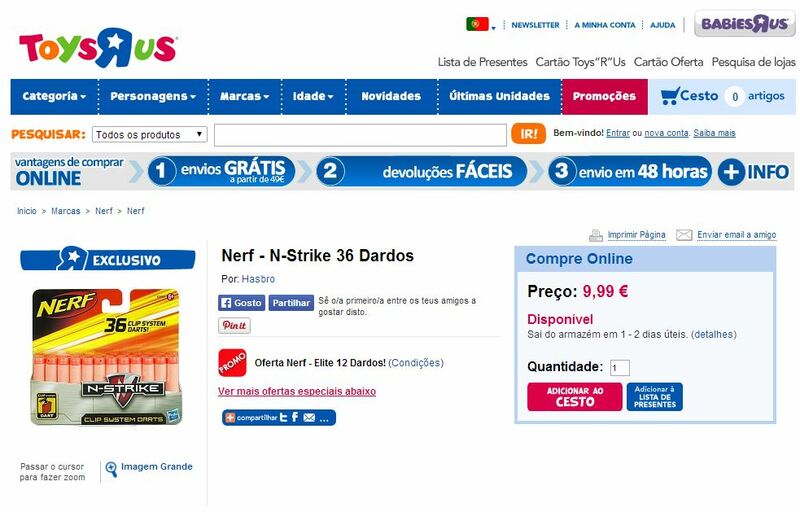 Some days ago, I realize that some old Nerf products were showing up in Toys R Us in Portugal. 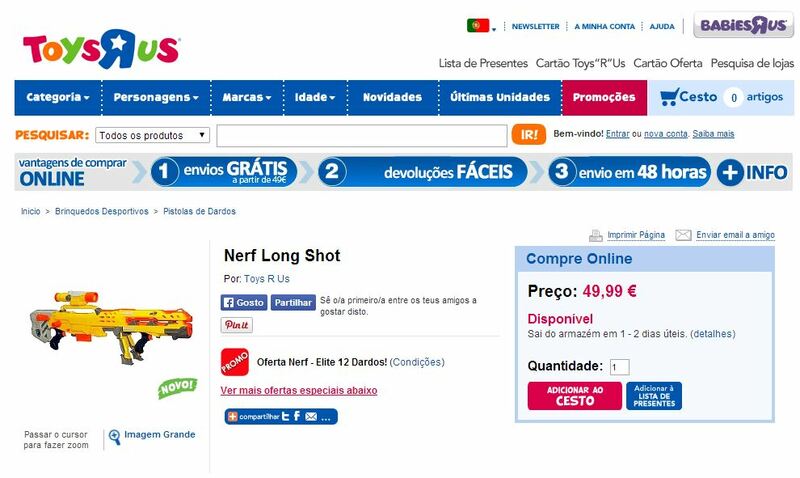 As you might know the Longshot is still sold in Portugal. I went to Toys R Us website yesterday and I found that the Longshot (2006) was classified as a new product. You can see the Print Screen that I took. I looked a little more and the 36 streamline dart pack (2006) showed up in the website to (I knew they were sold in stores – because they showed up around Christmas – but I didn´t knew they were sold online too). Besides that, I went Toys R Us a couple weeks ago, and I saw 10 BNIB Magstrikes for sale, which is weard because they were never sold in here. No pic though. Is Toys R Us going to sell old blasters instead of new blasters? Lets hope not! This entry was tagged Dardos, Darts, ExtremeNerf, Longshot, Nerf, Nerf Portugal, Portugal, Toys R Us, Toys´R Us. Bookmark the permalink.